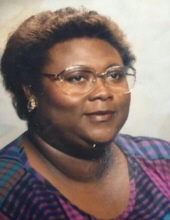 Clara Lee Euell, 62, of Freeport passed away Thursday March 14, 2019 in her home. Clara was born on April 14, 1956 in Pickens, MS the first daughter of Welton Euells and Elezia (Hollins) Euells. She was a member of St. James CME Church at an early age. She attended Robert Morris University as a dental assistant. Clara was employed at varies agencies and companies in the city of Freeport. Clara worked at Thermos, Freeport School District, and Malcom Eaton. Clara also volunteered at the Boys and Girls Club. Clara’s family and friends will miss her dearly and will always carry her in our hearts. Clara’s preceded in death by her grandparents Lilbert and Mary Hollins and a host of aunts, uncles and cousins. Clara leaves to cherish her memory her beloved son Chase Tyler (Casey) Euell; two granddaughters Reese Nicole Euell and Lennox Lee Euell; her parents Welton Euells and Elezia (Hollins) Euells; nine sisters Hilda (Garry) Edison Sr., Betsy Euells, Vanessa (Jimmy) Euells-Fricks, Nancy Euells, Natalie Euells, Susan Euells, Stacy Euells, Angelia Euells-Moffett and Patricia Dixon; two brothers Timothy Shaw Sr. and Charles Cowans; aunt Parthenia Williams; uncle Lilbert Hollins Jr.; and a host of nieces, nephews, cousins and friends. Special thanks to her caregivers Dorothy Chatman and Natalie Euells. To send flowers or a remembrance gift to the family of Clara L. Euell, please visit our Tribute Store. "Email Address" would like to share the life celebration of Clara L. Euell. Click on the "link" to go to share a favorite memory or leave a condolence message for the family.